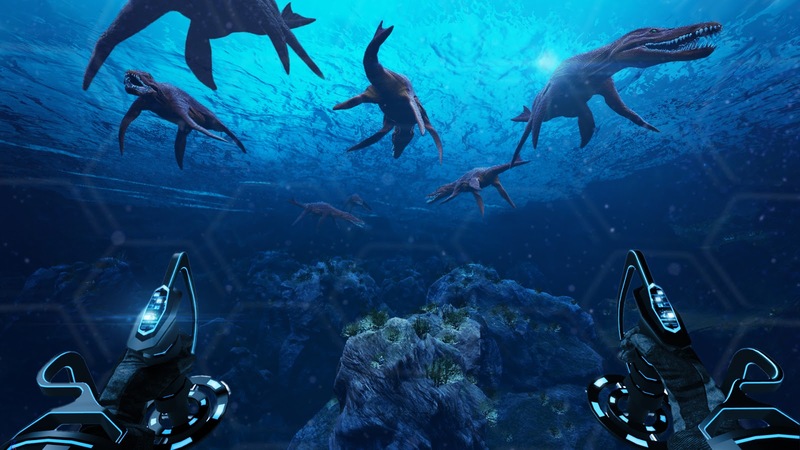 The last thing that I imagined I would be doing at PAX Prime is swimming with dinosaurs, but an Oculus and Time Machine VR made it possible! , there has been such deep ice cap drilling that mankind has unleashed a 15 million year old virus and humans are beginning to go extinct. Your job, as a scientist, is to go back to the Jurassic are and study the creatures living there and how they survive with this virus in their ecosystem. The demo was straightforward but breathtaking. Beginning your journey in the mountains of Svalbard, Norway, you access certain time travel hubs for different areas and eras,bringing the portal with you as an exit point. Science seems sound so far, I guess. While exploring and studying the areas and creatures living within them, you can perform a number of actions such as baiting the creatures, performing standard scans, echography scans, and even freezing time if you need to get into or out of a dangerous place. Time Machine VR is purely designed for virtual reality, and as such has faced many original design challenges which the Minority team has had to overcome. I spoke with Patrick Harris, the game's design lead. Many of the problems were very interesting; his first concern is people being able to play the game comfortably. Many adjustments had to be made with speed, latency, and in game jerk motions, which is also the primary reason that all levels are currently underwater. The underwater movement is a bit more gentle on the senses and allows the player more room and time to explore without getting motion sickness. Another challenge had to do with the targeting system for bait and tracking devices. In a standard game, the crosshair is where the bullet goes, in this case they have had to expand the area of impact and how the device/bait behaves in a thrown arc in order to compensate for the slight inaccuracy that needed to be programmed in for it to function in a VR environment. The attention to detail in is very impressive. Minority even has a paleontologist on their team to ensure that the currently understood behaviors of these beautifully modeled prehistoric beasts is simulated appropriately by the game's AI. 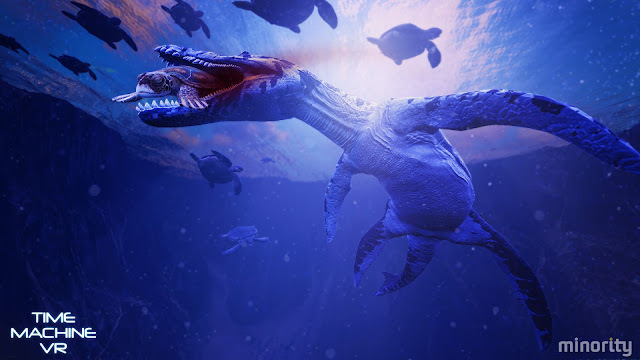 Currently, I don't believe marine reptiles were capable of going through walls, but I'm certain that as the game progresses this will be fixed. Time Machine is still in its infancy in Steam Early Access, and there is an extraordinary amount of content to come. Inside of the time machine cockpit is just as interesting as the outside world to me. I love that it assists in adjusting the headset in the beginning, looking up you see the time zone you are in as well as your current temporal area. Looking down, you see your body. The hands and fingers move in accordance with the controls, so if I shoot a tracker, that hand will be pushing buttons! Assisting you along the way is an AI named Rob, he reminds me a little bit of a more mature version of Nolan North's Ghost from Destiny. Overall, I like him; his voice is very soothing and I like that he provides you with information from the scans on the fly so that you don't need to wait for big pieces of your data until you get back to the hub in your time. This was by far the most immersive and beautiful games that I played during PAX (I was sucked into the current content demo for a full hour or so while my poor husband waited). It captured my sense of wonder and imagination to the extent that I'm questioning why I didn't follow 5 year old me's advice to become a paleontologist!